Meet green-eyed Kobe! Kobe was scared when he arrived at his foster home but has since discovered that pets and chin rubs are pretty good! He is wary when people enter his room but the crinkle of a treat bag brings him running! He loves to snuggle in his foster mom's lap and purrs all the time! He is quite fond of chasing the feather toy and has managed to rip a fair number of feathers right out! He is curious about what goes on outside his room and likes to peer out when his foster mom enters. 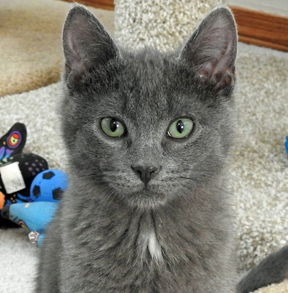 He is gentle with his brothers and loves to play and snuggle with them. He would do best in a home with older or teen children. Make Kobe a part of your family today!